How does IDrive for Mac secure my data? How do I configure Snapshots using the IDrive for Mac application? I have lost a file, which was probably backed up four days ago from my Mac. How do I restore it? IDrive for Mac uses 128-bit SSL encryption to transfer your data between the application and the server. IDrive for Mac allows historical view of data by way of Snapshots. They are useful in case you accidentally delete files stored in your account and want them to be restored to your local machine. The available daily Snapshots have been set to 10 (this may change without notice). The additional storage requirements for Snapshots have no impact on your account quota usage. Once you click the 'Snapshot' icon, you can see files stored in your IDrive for Mac account during the previous days under newly created folders, with date, nightly. * or weekly. * extensions. nightly.0 extension refers to the most recent Snapshot. nightly.1 extension refers to the Snapshot that is a day older vis-à-vis the most recent Snapshot. 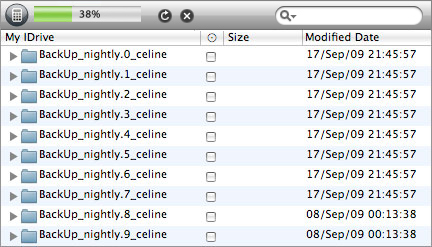 nightly.2 extension refers to the Snapshot that is two days older vis-à-vis the most recent Snapshot. You can restore the files which you need from these directories just as you would, for any file or directory. To enable the Snapshots, click the 'Snapshots' icon on the tool bar or select the 'Show Snapshots' check box under Preference > General. I have lost a file, which was probably backed up four days back from my Mac. How do I restore it? You can restore files that were backed up earlier using 'Snapshots'. If you recall the name of the folder in which the file was stored, then try and navigate to the file / folder starting from folder nightly.3. This could contain the data that you backed up four days ago. If not, try nightly.4. Once you locate the file, simply restore it. 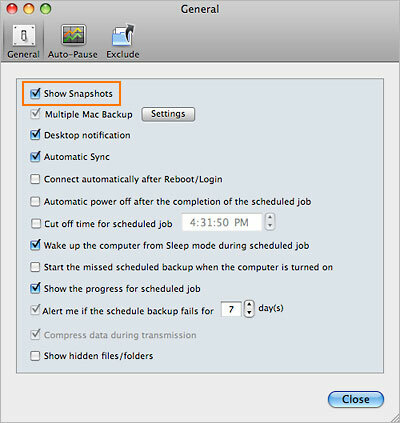 (IDrive for Mac does not have the concept of separate full and incremental backup files, as the latter are directly written on top of the full backup).